The Spring Boot JPA One to One Foreign Key Relationship Mapping Example shows you the process of mapping an one-to-one relationship using Spring JPA and Spring Boot. A OneToOne relationship in Java is where the source object has an attribute that references another target object and (if) that target object had the inverse relationship back to the source object it would also be a OneToOne relationship. All relationships in Java and JPA are unidirectional, in that if a source object references a target object there is no guarantee that the target object also has a relationship to the source object. This is different than a relational database, in which relationships are defined through foreign keys and querying such that the inverse query always exists. 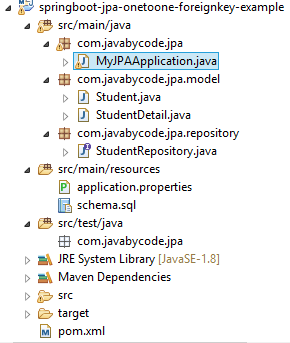 Our classic mvn project in this Spring Boot JPA One to One Foreign Key Relationship Mapping Example. We are using a database named example_onetoone and two student and student_detail tables . The student and student_detail tables have a one-to-one relationship via student.id and student_detail.student_id. Entity class Student and StudentDetail are simple POJO class. Here we are using class Student and StudentDetail with JPA @Entity annotation to map them to a database tables (these tables were created in above step). @Table annotation maps the entity with the table. If no @Table is omitted, the default value is used. It means that the class name of the entity maps with the table. @Id annotation marks the identifier property of the entity. @Column application maps the entity’s field with the table’s column. If @Column is omitted, the default value is used. It means that the field name of the entity maps with the table’s column. @OneToOne annotation defines a one-to-one relationship with another entity. The annotation @JoinColumn indicates that this entity is the owner of the relationship (that is: the corresponding table has a column with a foreign key to the referenced table), whereas the attribute mappedBy indicates that the entity in this side is the inverse of the relationship, and the owner resides in the “other” entity. In this example, we all need to extend the JpaRepository. This is a built-in Repository implemented some common functions to work with database: findOne, findAll, save,etc.